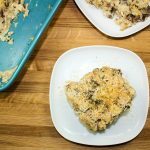 Turkey Sausage Squash Casserole is a delicious casserole packed with fresh ingredients perfect to feed a crowd. Weight Watchers friendly recipe- 4 SmartPoints! I am always looking for food hacks. When I say food hacks, I basically mean healthy food swaps for unhealthy food. I love pasta, but try not to over indulge in making pasta too often at home. I’ve been obsessed with using vegetables in place of pasta. 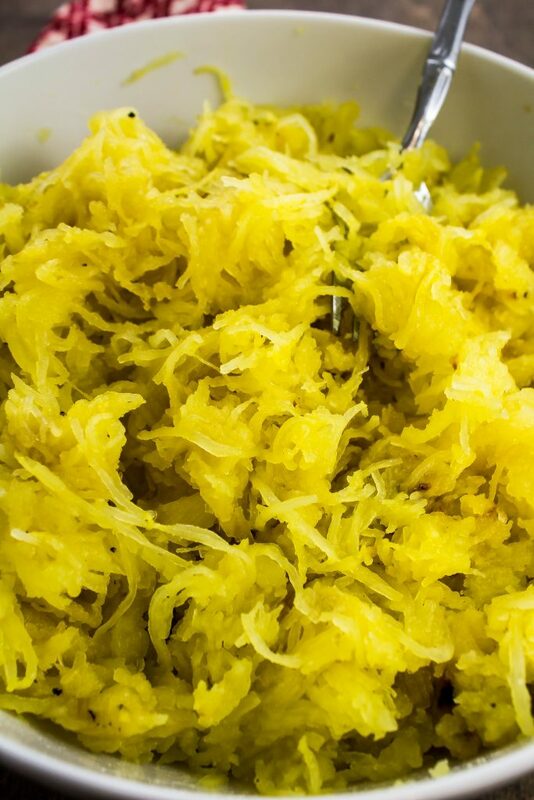 When cooked just right, spaghetti squash is just like pasta! 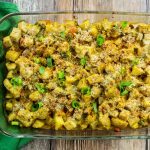 My Turkey Sausage Squash Casserole is a delicious casserole packed with fresh ingredients perfect to feed a crowd. Roasted spaghetti squash, turkey sausage, mushrooms, spinach, and beans mixed in a delicious cheese sauce. This is a Weight Watchers friendly recipe and each serving is 4 SmartPoints. Turkey sausage has become a regular in my house lately. It’s healthy, packed with flavor, and super versatile. I honestly didn’t even realize how many different varieties of turkey sausage were out there until I really looked at the select at the grocery store. 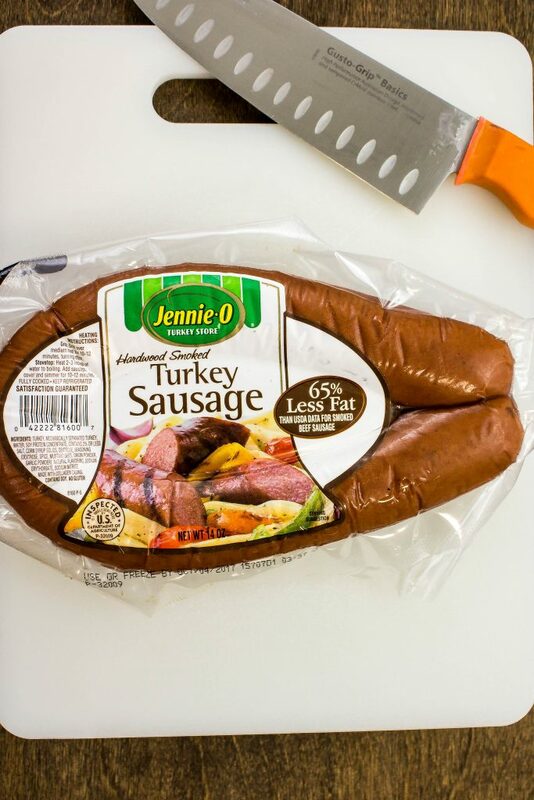 One of my favorite varieties of turkey sausage is Jennie-O Hardwood Smoked Turkey Sausage. It’s already cooked and packed with delicious smoky flavor. A while back, I made a chicken sausage and pasta skillet dish, Skillet Chicken Sausage Alfredo Pasta. I was craving these flavors but didn’t want to make a pasta dish. Lately I’ve been cooking a lot with spaghetti squash. I really like to use this veggie in place of pasta. When cooked just right, it has the same texture as regular spaghetti noodles. Some of my favorite dishes to make are casseroles. I’ve never met a casserole I didn’t like. 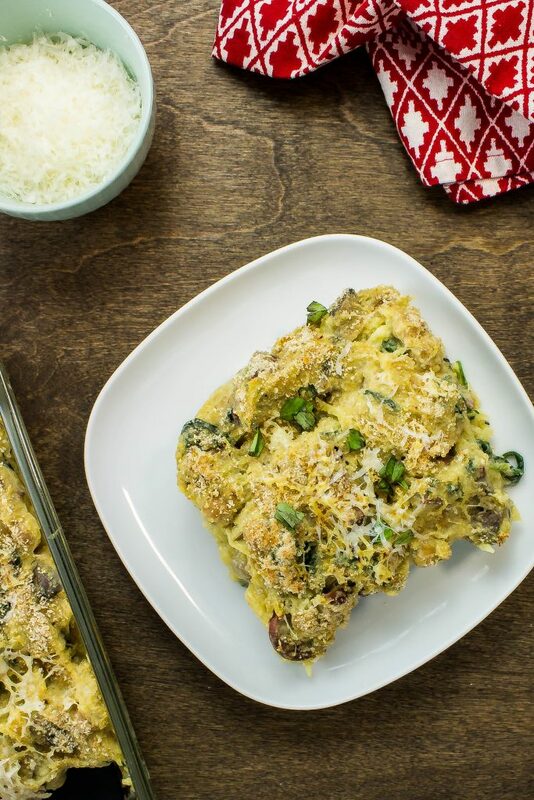 Casseroles are perfect for dinner; you can mix a bunch of random ingredients together, bake it, and have dinner for days! 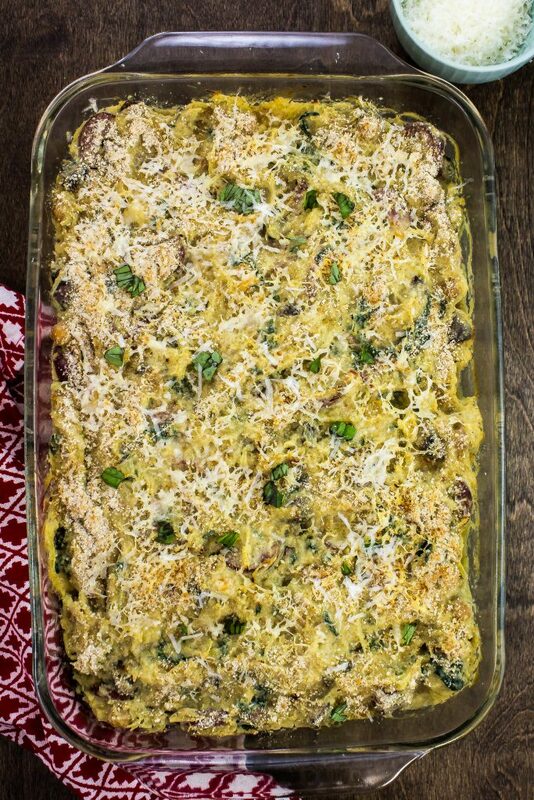 I knew I wanted the flavors of “alfredo” so I created this casserole. Delicious smoked turkey sausage, spaghetti squash noodles, mushrooms, baby spinach, and garbanzo beans mixed in a creamy cheese sauce. What’s not to love?! To start, make the squash according to my Roasted Spaghetti Squash recipe instructions. If you like to meal prep like I do, make the squash on Sunday so that you have it all cooked when you are ready to make this casserole during the week. 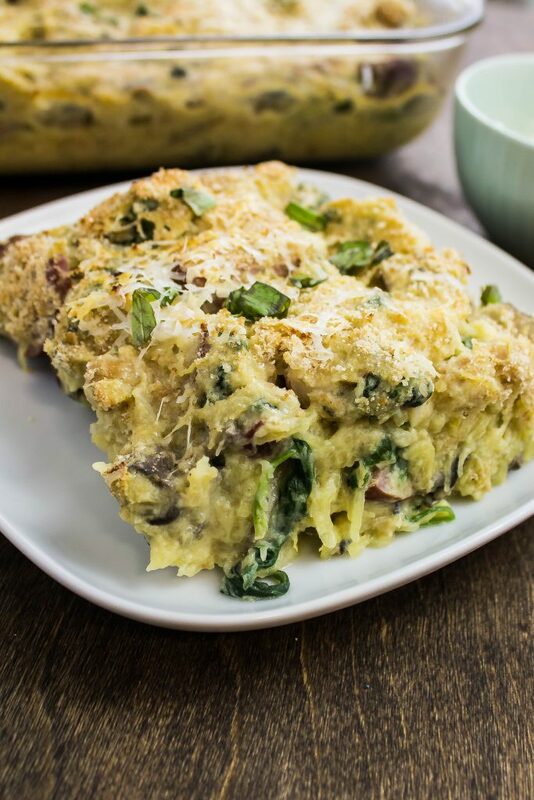 This casserole has tons of delicious vegetables! 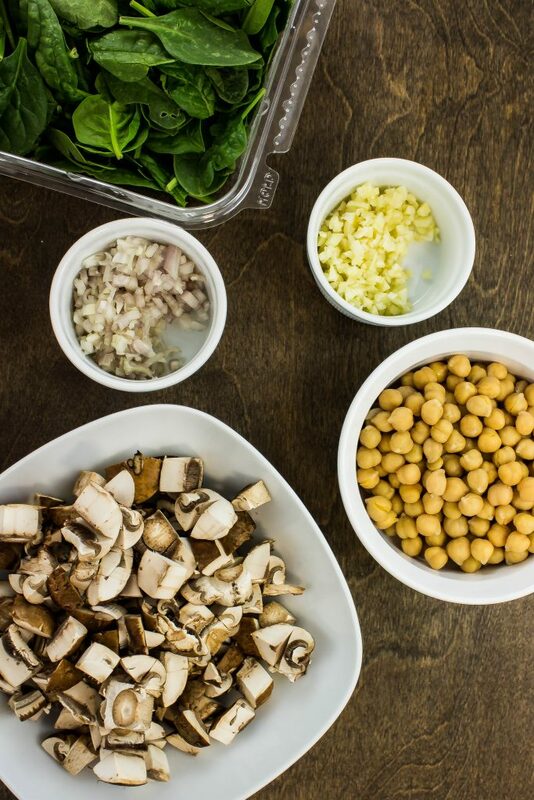 I’m all about the prep when it comes to cooking so I like to prep all my ingredients first before I start to cook. To prep, dice mushrooms, garlic, and shallot and set aside. Next, drain canned garbanzo beans and set aside. 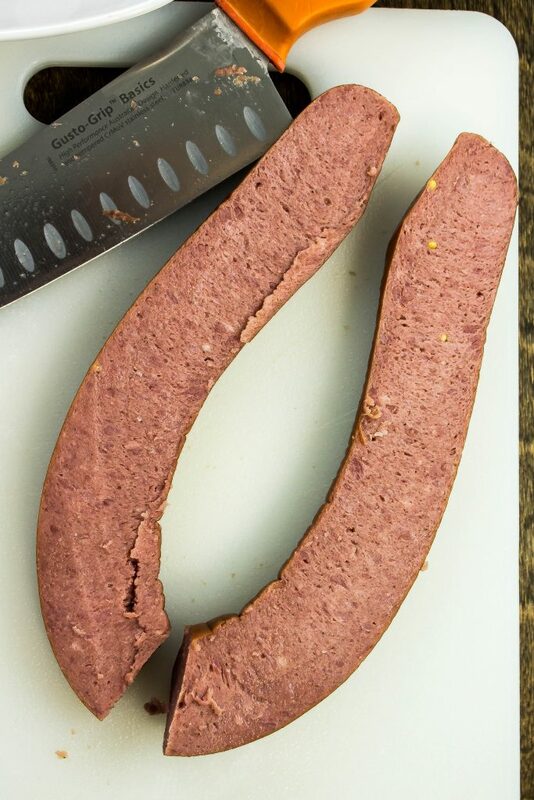 Slice turkey sausage in half, then cut into pieces and set aside. Once everything is prepped, heat large skillet over medium low heat and add butter. Next, add diced mushrooms and shallot. Sauté for 7 minutes until mushrooms are tender. Add garlic and sauté 1 minute. Next, make the based for the cheese sauce! Sprinkle flour on top of the veggies, mix well and let cook 1 minute. Slowly add half & half and vegetable broth and stir continuously. Once flour has mixed with no clumps, let cook until sauce and thickened, about 5 minutes. Add seasoning and mix well. Add baby spinach, turkey sausage, and garbanzo beans, then let cook until spinach has wilted. Sprinkle mozzarella cheese and add spaghetti squash to the skillet; mix until well combined. Spray casserole dish with cooking spray and spread squash mixture into the dish, spread evenly. In a small bowl, mix breadcrumbs and Parmesan cheese. Sprinkle on the top of the casserole. Lastly, bake for 15 minutes at 400 degrees then broil on high for 3 minutes. Turkey Sausage Squash Casserole is a delicious casserole packed with fresh ingredients perfect to feed a crowd. Roasted spaghetti squash, turkey sausage, mushrooms, spinach, and beans mixed in a delicious cheese sauce. Great for dinner and even better for leftovers! Only 125 calories and 4 Weight Watchers SmartPoints per serving! 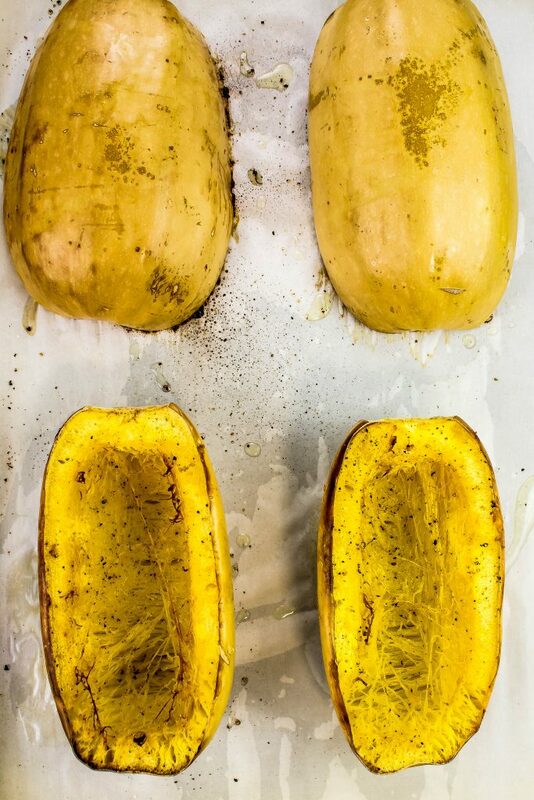 Roast Roasted Spaghetti Squash according to recipe instructions. Dice mushrooms and set aside. Mince shallot and set aside. Heat large skillet over medium low heat and add butter. 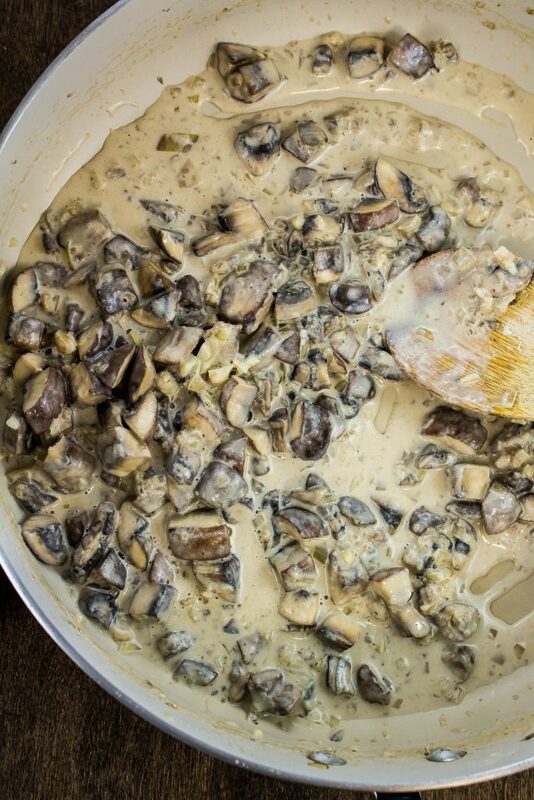 Once butter is melted, add diced mushrooms and shallot. Sauté for 7 minutes until mushrooms are tender. Add garlic and sauté 1 minute. Sprinkle flour on top and mix well. Let cook 1 minute. Slowly add half and half and stir continuously. Slowly add vegetable broth and stir continuously. Let cook until sauce and thickened, about 5 minutes. Add salt, pepper, dried oregano, and red pepper flakes. Mix well. 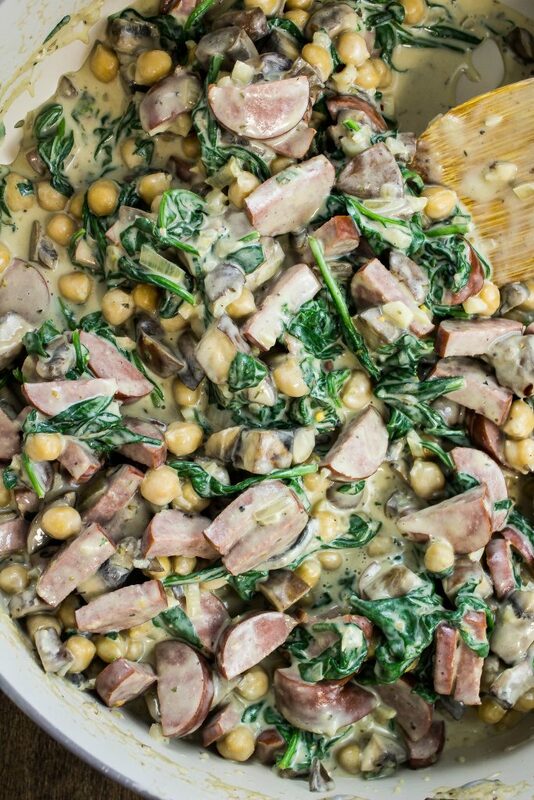 Add baby spinach, sausage, and garbanzo beans. Let cook until spinach has wilted. Add mozzarella cheese and shredded spaghetti squash to skillet and mix well. Turn off heat and let rest. Spray casserole dish with cooking spray and spread squash mixture into the dish, spread evenly. In a small bowl, mix breadcrumbs and parmesan cheese. Sprinkle on the top of the casserole. Bake for 15 minutes then broil on high for 3 minutes. October 18, 2017 at 2:45 pm This looks delicious! I've never made spaghetti squash and have been meaning to try! I'll try this out! Thank you! 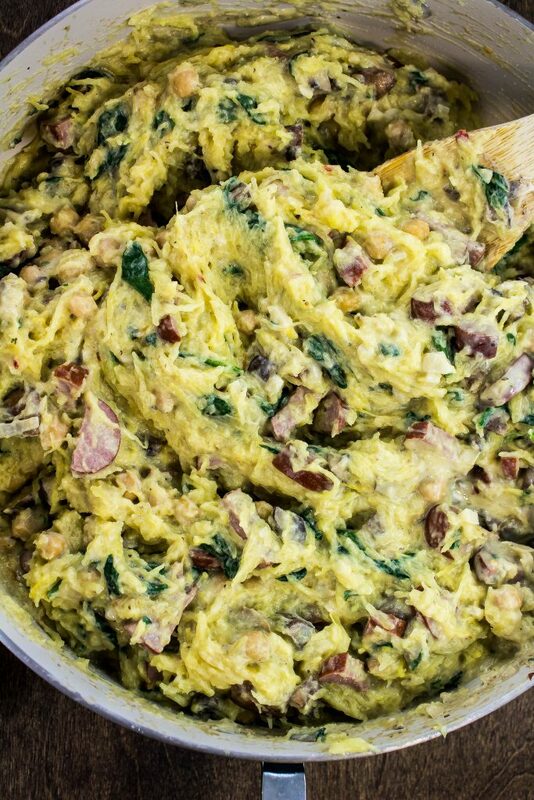 October 23, 2017 at 4:35 pm You should totally try making spaghetti squash Jolene! October 18, 2017 at 3:57 pm OMG this looks delicious!! can't wait to make it for dinner asap! anything with butternut squash is good in our house! 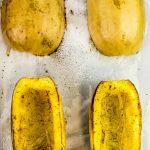 October 23, 2017 at 4:35 pm Squash is so good! October 19, 2017 at 1:00 am This looks so good! Butternut squash is perfect for fall! October 19, 2017 at 2:34 pm You know what? 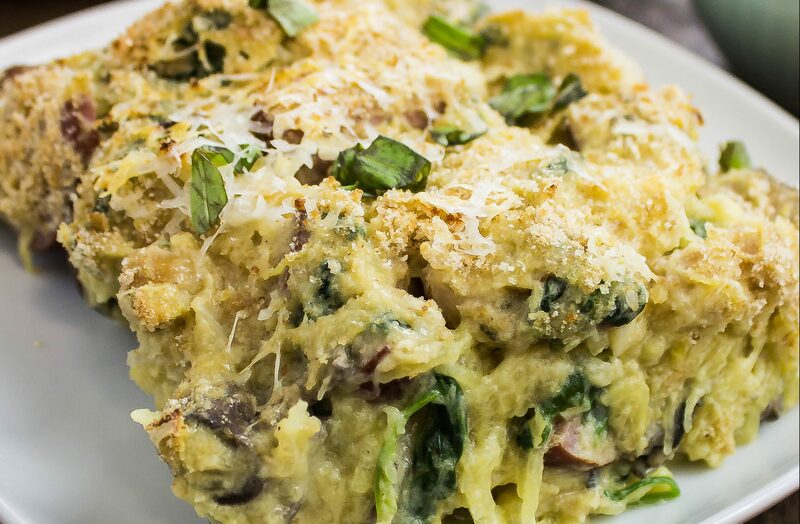 I've never had spaghetti squash but this looks delicious! October 23, 2017 at 4:34 pm You should totally make it Juli! !